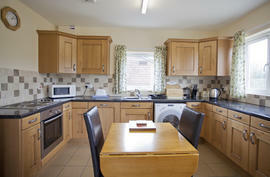 The Turbles - Malvern View has lovely views of the surrounding countryside. It is one of three modern, clean and comfortable, one bedroom self catering bungalows that are well equipped for couples wanting to stay in a peaceful, rural location near the Malvern Hills. Malvern View is on one level so provides easy access. Hand rails are provided by the toilets and in the showers so may be suitable for people with limited mobility (please ask). 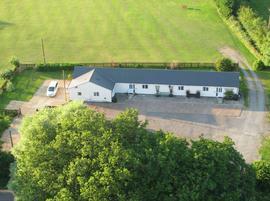 It is situated in a quiet, rural location approximately 3 miles from The Three Counties Showground. Malvern View has an enclosed garden and is adjacent to a large lawned area which allows a small number of caravans to stay. The Turbles - Malvern View is an excellent base for walking and cycling. A green lane from the site provides an attractive walk to Castlemorton Common at the foot of the Malvern Hills. There are 2 pubs and a village shop nearby. The closest towns are Upton Upon Severn (5 miles), Malvern (7 miles) and Ledbury (7 miles). Malvern View has Free wi-fi, 42” flat screen HD TV with Freesat and DVD player, a well equipped kitchen with dishwasher and washing machine, king size bed, ample parking and garden furniture. Bedding, towels, electricity and central heating are included. Enclosed garden. Plenty of space. Great base for walking and cycling. Green lane from site provides an attractive walk to Castlemorton Common at the foot of the Malvern Hills. 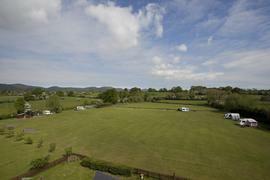 3 miles from Three Counties Showground (Worcestershire, Herefordshire and Gloucestershire). Local Services: 2 pubs and village shop nearby. Closest towns are Upton upon Severn (5 miles), Malvern (7 miles), Ledbury (7 miles)and Tewkesbury (11 miles). Exit the M50 at junction 2. Head Southeast on A417. Take first left at Redmarley D-Abitot towards Malvern. At T-junction turn left onto Gloucester Road/B4208 for 2.5 miles. Continue past The Robin Hood. Take the next right (at the bottom of the hill) into Druggers End Lane. The Turbles Holiday Apartments are the first turning on your left — approximately 500 metres from the junction. Exit the M5 junction 7 and take a right onto A44 heading to Worcester. At the next roundabout take the 1st exit onto Crookbarrow Way/A4440—go over 1st roundabout and at the 2nd roundabout turn left onto Bath Road (A38). Continue for approx 7 miles. ½ mile after The Yorkshire Grey pub turn right for Upton Upon Severn onto the A4104. Go over the bridge and turn left. Drive through Upton and continue on the A4104 for approx 4 miles until you reach the staggered crossroads in Welland (nr The Pheasant pub. Turn left onto the B4208 towards Gloucester. Drive through Castlemorton Common, continue past The Plume of Feathers pub. Take the next left (at the bottom of the hill)into Druggers End Lane. 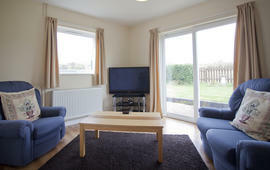 The Turbles Holiday Apartments are the first turning on your left — approximately 500 metres from the junction.